there is nothing much that i enjoy more than spending time with all the kiddos i am lucky enough to have in my life. such joy. such bare-everything honesty. such unique and wonderful personalities. 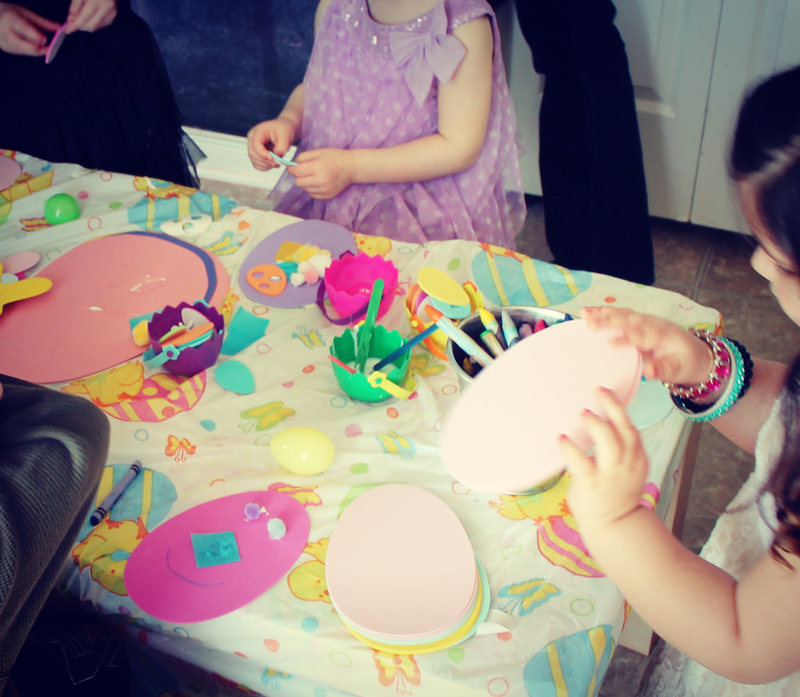 knowing that there would be 8 kiddos under the age of 4 – mostly 2 & 3s – coming to the lil bunnies party, i was certain that my preparation and activity choices would either make or break my sanity. at least I knew the 2 older kiddos coming might balance the crazy out a bit ! 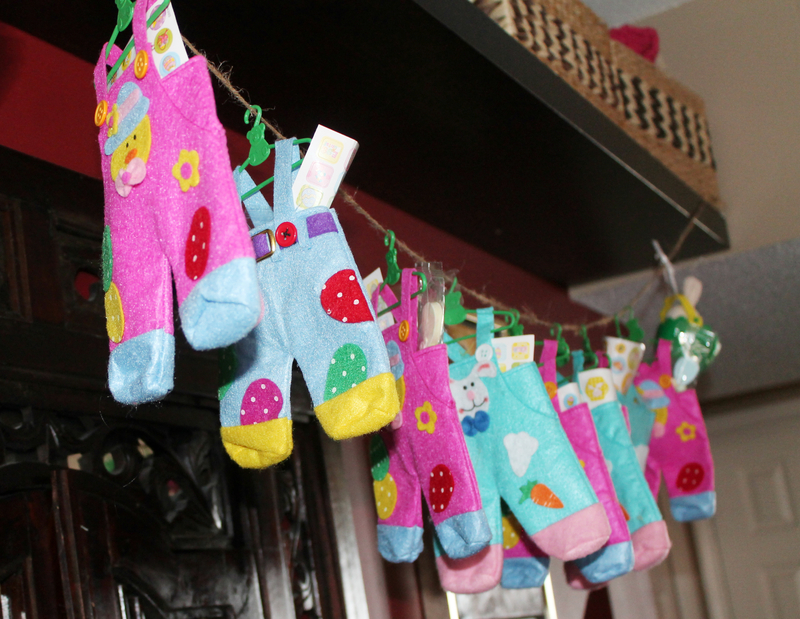 decorations were kept simple. my kiddo helped me decorate and we kept it kid friendly. i admit i was disappointed that my chevron runner had not arrived in time – you can wipe it and everything ! c’est la vie. the checked table cloth worked just as well ! my sweet C was so excited she literally sat the entire morning at the table waiting for the party. from the minute she woke up saying “i didnt know you did this! !” when she saw the table…she parked herself in her spot and only got up to get dressed and then answer the door. “i love having parties” she kept saying. her momma’s daughter – i think so ! i kept the activities simple and basically without the need for much facilitating. i wanted to spend time giggling and playing and eating and chatting. this was important to me about this day. getting to BE with everyone i so love. 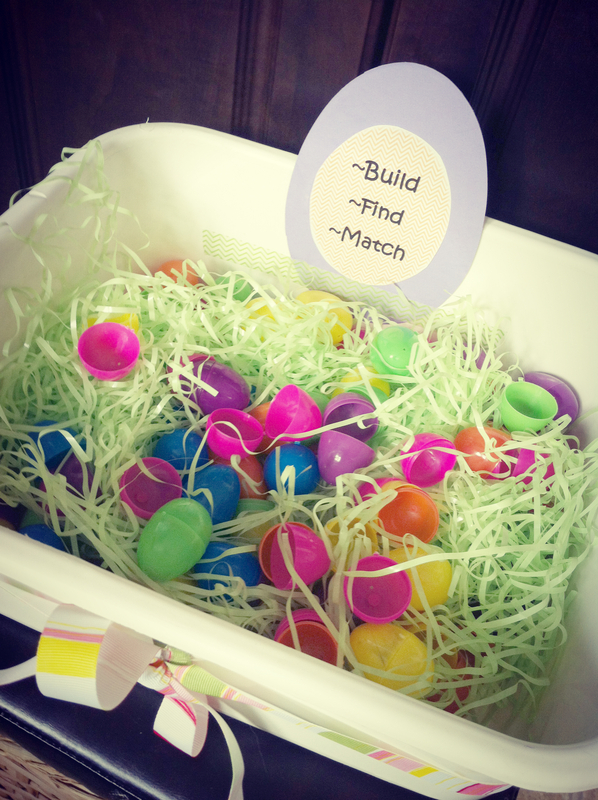 there was a plastic egg bin for sorting, matching, stacking, counting, finding – some kind of fun for most ages. 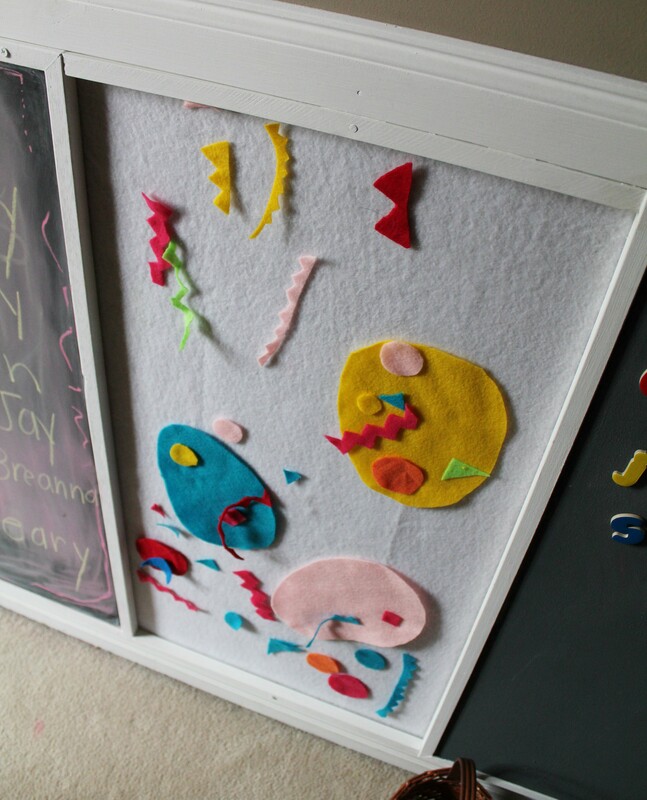 and an easter egg felt board activity. 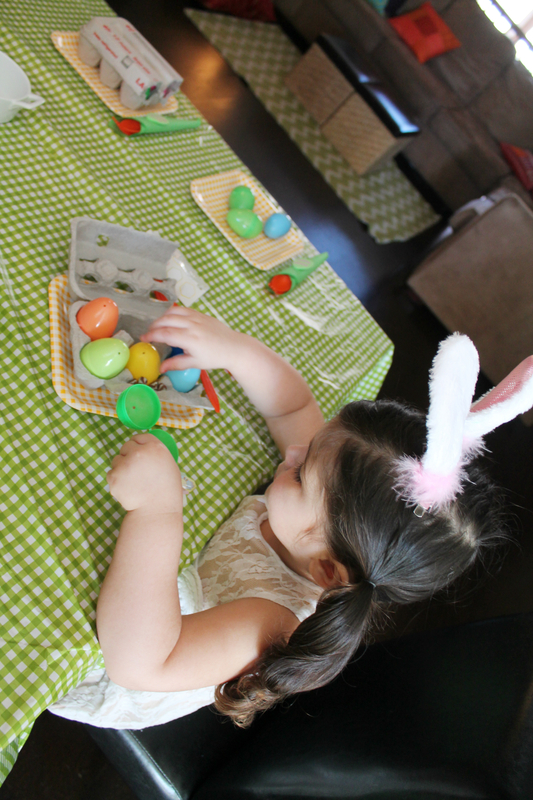 we also had a mini egg hunt. 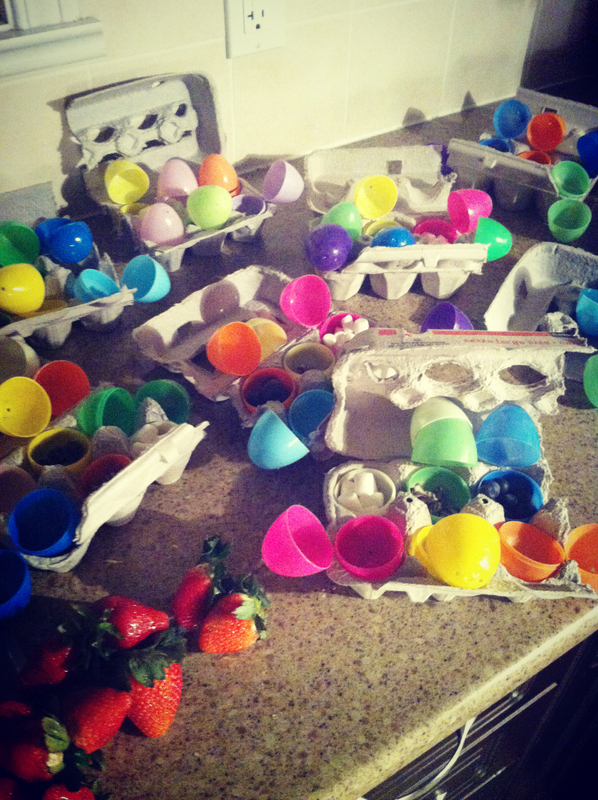 i debated having an egg hunt. for a few reasons. the first is i that did not want to take away from the big hunt that the bunny would unleash on easter morning. the second reason was how the heck do you make a hunt that is fair and not insane for 10 kiddos at such different ages. so simple it was. a practice run for the real bunny hunt coming the next morning. 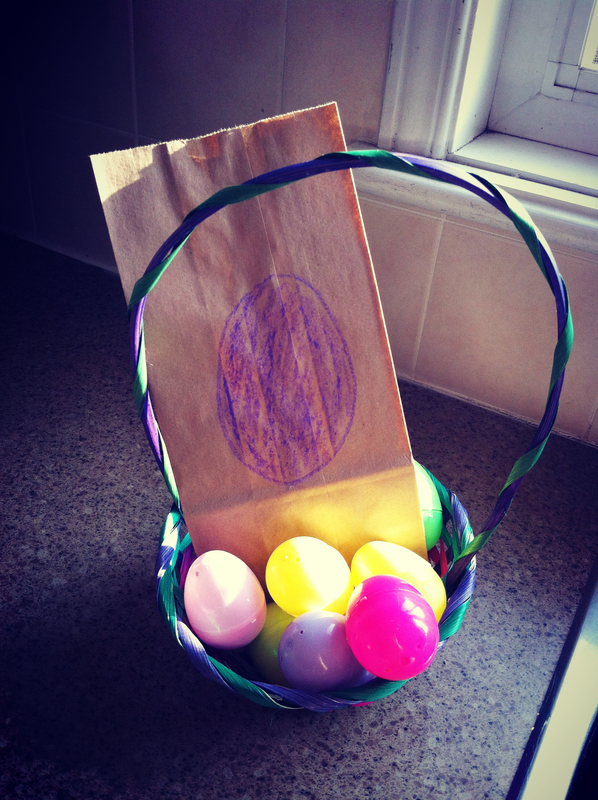 each kiddo was given a paper bag with a hand drawn colored egg. the challenge was to find 4 eggs that were the same color as the egg on the paper bag. see, i told you simple ! and the older kiddos that came were super duper egg hiders who snuck away while the lil bunnies were having their pancake brunch. 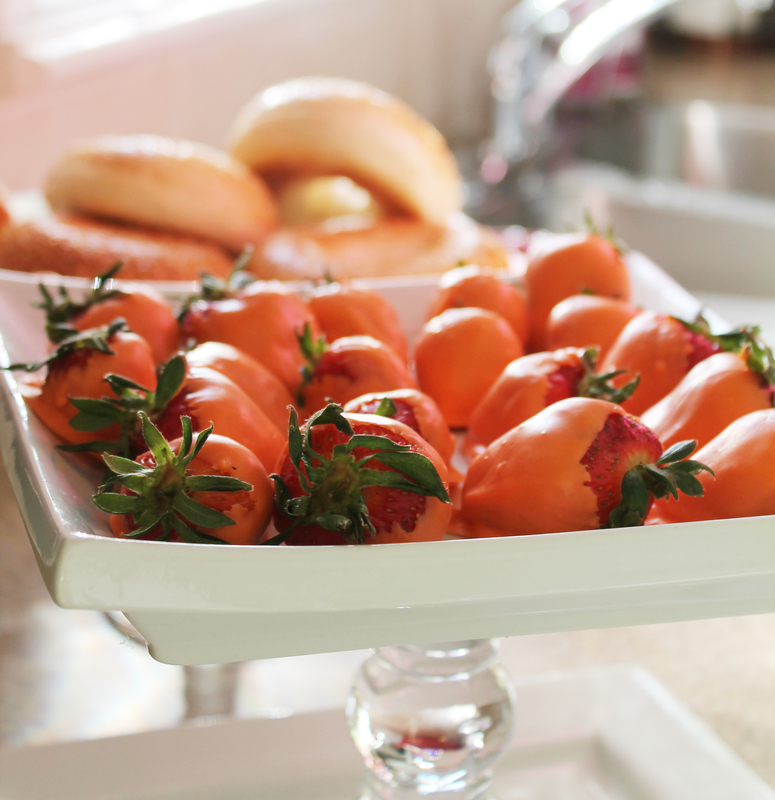 fun and simplified munchies were served. 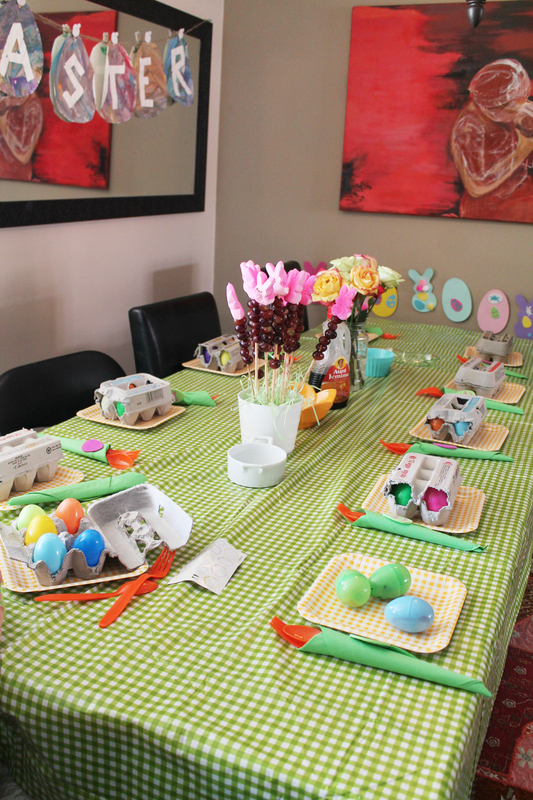 we had pancakes with plastic eggs filled with berries, marshmallows, sprinkles, chocolate chips prepared the night before. 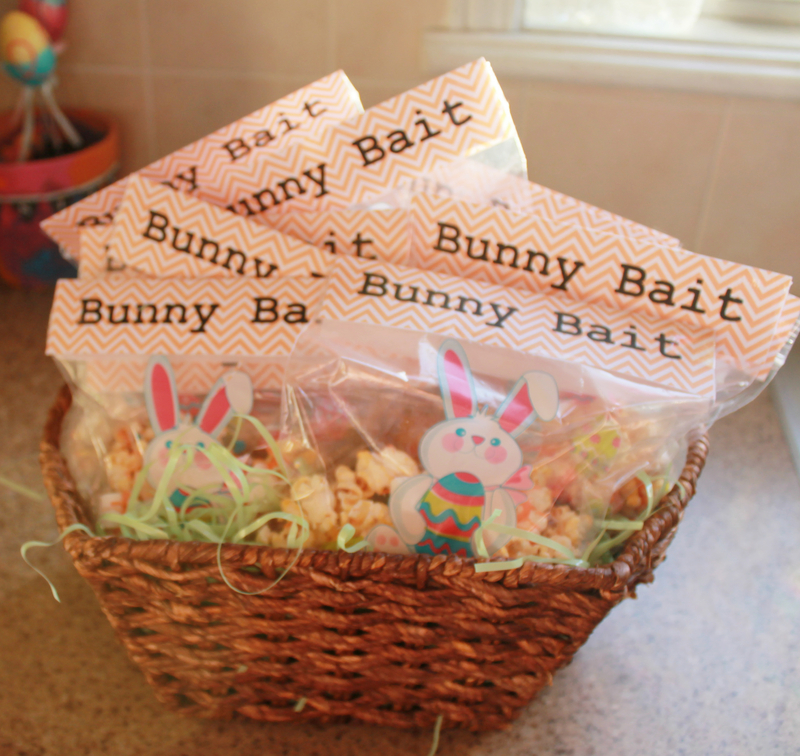 here is a Bunny Bait Printable for tags that fit perfectly on a sandwich baggie ! 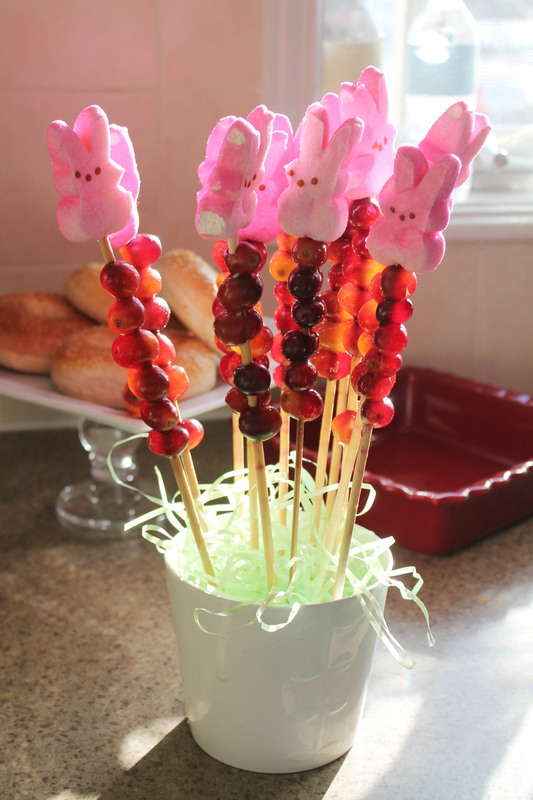 we hope you had a wonderful easter weekend however you celebrated it !